Counted as a first among the best, we provide patrons with the best quality of Filter Press Sludge. We are offering our client an excellent quality range of Sludge Dewatering Filter Press. These Sludge Dewatering Filter Press are made from very high quality raw material which ensures high durability at its user end. The solids from the primary filtration equipments carry a lot of moisture with them, which has to be dewatered further. The V-SEP Screw Compactor efficiently does the job. we deal in Fully Automatic Sludge Dewatering Press. client satisfaction is our main objective. 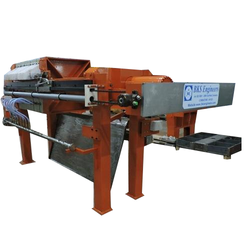 We are engaged in offering Sludge Dewatering Filter Press. Keeping the diverse requirements of customers in mind, our company offers excellent quality assortment of Sludge Dewatering Filter Press. Our product range is available in different sizes, designs and models according to the client’s requirements. This Sludge Dewatering Filter Press is known for its optimum performance. Paleo Crystal Enviro Technologies Pvt. Ltd. Being a leader in this industry, we are devoted towards providing a premium quality array of Sludge Filter Press.